Health concerns about fat and cholesterol have prompted many people to become vegetarians, and the nutritional deficiencies that can sometimes result may reveal themselves during dental exams. Academy of General Dentistry spokesperson Ludwig Leibsohn, DDS says he usually asks patients if they adhere to vegetarian or other special diets. "Most adult vegetarians are very knowledgeable about nutrition," says Dr. Leibsohn. "They maintain their diets in a proper fashion." Children, however, need a well-balanced and nutritionally complete diet for proper growth, and the potential for deficiencies is greatest among children and teenagers who put themselves on vegetarian diets without knowing enough about their nutritional needs. Although vegetarian diets vary, some vegetarians, particularly those who do not consume any food of animal origin, can experience deficiencies in calcium, vitamin D, riboflavin, vitamin B12 or complete proteins. Studies show that by eating the right amount of fruits, vegetables, grains and legumes, they can get the nutrients they need. "An adult on a vegetarian diet for a prolonged period can be at increased risk for periodontal (gum) disease from a lack of vitamin D and calcium," says Dr. Leibsohn. Dr. Leibsohn recommends that anyone considering adopting a vegetarian diet seek counseling from their dentist or a nutritionist to learn about substituting foods to get all the necessary nutrients. He also suggests taking a multiple vitamin daily. Teeth may soften when there is a shortage of vitamin D, becoming more susceptible to decay and periodontal disease. Vitamin D is produced in the body with sun exposure, so deficiencies are rare, but it can develop in those who do not consume milk or fish. Adding vegetable margarines or soy milk to the diet may solve the problem. Diet is an important part of an individual's medical history, and patients should always inform their dentist if they adhere to vegetarian or other special diets, says Dr. Leibsohn. Getting plenty of vitamin C is one way oral surgery patients can ensure timely recovery. Patients who neglect nutrition might be tacking extra days onto their recovery time, reports the Academy of General Dentistry (AGD). Deficiencies of vitamin C have been shown to significantly slow the healing process. AGD spokesperson Ludi Leibson, DDS, says he sometimes gives oral surgery patients high doses of vitamin C and multi-vitamin supplements before surgery. A patient's diet is crucial because adequate and appropriate vitamins, minerals, fats and protein are essential for the growth and regeneration of normal tissues. "You're going to delay the healing process and increase the possibility of infection if you're not getting the proper nutrients," says Dr. Leibson. Nutrients function individually as well as cooperatively in the healing process. The energy needed for tissue maintenance and repair is supplied by carbohydrates, fat and protein. Along with vitamin C, vitamins A, E, B, K and D are all integral to the healing process and a speedier recovery time. For example, vitamin A significantly contributes to healing by reducing the inflammatory period of tissue repair. If you are severely underweight or overweight, have recently lost weight, suffer from an acute or chronic disease or take medications such as steroids, immunosuppressants or chemotherapeutic agents, your nutrition status may negatively affect recovery from oral surgery. Dr. Leibson says he rarely sees patients who are malnourished, but that if someone is nutritionally compromised they should consider delaying oral surgery until they are no longer at risk. We all know that high-sugar foods and beverages such as soda or chocolate can increase our risk of tooth decay. But would you be surprised to learn that the time of day you eat matters as well? Night eaters are more likely to suffer from tooth loss. Not only that, but it is not just sugary foods that promote decay and tooth loss. Any foods eaten around this late hour can significantly raise your risk of tooth loss. If you are a nocturnal eater, find out how you can minimise the damage from your late night meals and snacks. According to a recent study, it does not even matter what kind of food you consume at night. Any food eaten at night will increase the risk of tooth loss. Researchers and dentists think this is because saliva flow is lower at night. Saliva has a protective effect on teeth. It helps to remove food particles from the mouth and to some degree, it also buffers against bacteria. When people eat at night, their reduced saliva flow means that the acidic effect of food is magnified. That sandwich or pasta you ate last night could potentially have been less harmful if you had simply eaten it during the day. In the study, researchers looked at quite a large sample. More than two thousand men and women aged thirty to sixty took part in the study. Their health was assessed through questions that investigated oral health, eating habits and also their general health. Nearly ten percent of participants were nocturnal eaters, meaning they take in a quarter or more of their daily food intake at night. These people would also awaken at night on occasion and have a snack. Researchers found that even after removing interfering factors such as people smoking or eating a lot of sugar, nocturnal eaters lost more teeth later on in the study. This was in comparison to those who were not nocturnal eaters and consumed food more evenly throughout the day rather than at night after their evening meal. One important part of this study is that it suggests dentists should be screening their patients to find out which ones are nocturnal eaters. While it may seem invasive to be questioned about your eating habits, it could mean reducing your risk of tooth loss later on in life. Recommendations for people who are nocturnal eaters – other than modifying their eating habits – are to pay special attention to brushing and oral hygiene. If you are one of these nocturnal eaters, make sure you brush teeth at least twice a day using a fluoride toothpaste. Also, ensure that you make one brushing session happen right before you head to bed. Another recommendation is to only drink water for a minimum of one hour before going to bed. Combined with good brushing habits, you can minimise the damage from late-night snacking and meals. Holistic dentistry works on the belief that the body is more interdependent than it seems and that the teeth and gums have a big role to play in it. They actually suggest modifications and additions in your diet to help teeth get stronger and invariably help your body too. You must make sure that you have a wholesome diet that included proteins, minerals, vitamins and other essential good groups for a strong body and whiter and sparkling teeth. Here is a list of foods you should include in your diet for nutritious teeth. Herbal Tea: The key to healthy teeth and gums is killing harmful bacteria and sipping on herbal tea can do just that. Green tea or herbal tea has catechins that is an anti oxidant and kills germs in your mouth as well and also help with bad breath. It is also a great source of fluoride. Onions: They may not do much for your breath but they help to keep your blood pure and kill germs in your mouth and teeth with their sulphur elements. Cheese, Milk, Yoghurt: Cheese may not be something that a dietician prescribes but it certainly helps to keep you teeth shiny and white. Milk and yoghurt are rich in calcium, and helps keep teeth strong. It also regulates the ph balance of teeth. Celery: This is recommended by many holistic dentists. Celery helps secret excess saliva that gets rid of the bacteria Streptococcus that erode the teeth and cause cavities. It also massages the gums and makes them healthier. Oranges and other citrus fruits: High in vitamin C, oranges and fresh mushrooms provide the body with essential vitamins it needs to stronger and healthier. Sesame seeds: Sesame seeds actually help take off plaque take causes cavities and other infections. The also look after the bone surrounding the t0eeth and gums. Water is the remedy for everything. Consuming water cleanses your mouth and keeps your gums moist and hydrated. Try and avoid aerated drinks and dry fruits. They are full of sugar which is detrimental to oral hygiene contributing to tooth decays. Oral tissues, such as the gingiva (gums), teeth, and muscles of mastication (chewing muscles), are living tissues, and they have the same nutritional requirements as any other living tissue in the body. When adequate, nutritious food is not available, oral health may be compromised by nutrient-deficiency diseases, such as scurvy . In contrast, when food is freely available, as in many industrialized societies, oral health may be compromised by both the continual exposure of the oral environment to food and the presence of chronic diseases, such as diabetes . The diet not only affects the number and kinds of carious lesions (cavities), but also is an important factor in the development of periodontal disease (gum disease). According to the U.S. Surgeon General's report, Healthy People 2010, dental caries have significantly declined in the United States since the early 1970s. However, it remains an important concern, especially in specific subgroups in the U.S. population. For example, 80 percent of dental caries in children's permanent teeth are concentrated in 25 percent of the child and adolescent population, particularly in individuals from low socioeconomic backgrounds. Sugar, particularly the frequent ingestion of sweets (cakes, cookies, candy), is related to both dental caries and periodontal disease. For example, populations with a frequent exposure to sugar, such as agricultural workers in sugar-cane fields (who may chew on sugar cane while they work), have a greater number of decayed, missing, and restored teeth. Sugar ( sucrose ), has a unique relationship to oral health. Sucrose can supply both the substrate (building blocks) and the energy required for the creation of dental plaque (the mesh-like scaffold of molecules that harbor bacteria on tooth surfaces). Sucrose also releases glucose during digestion, and oral bacteria can metabolize the glucose to produce organic acids. However, oral bacteria can also produce organic acids from foods other than sugar. Oral health may be related to many nutritional factors other than sugar, including the number of times a day a person eats or drinks, the frequent ingestion of drinks with low acidity (such as fruit juices and both regular and diet soft drinks), whether a person is exposed to fluoride (through fluoridated water, fluoridated toothpaste, or fluoride supplements), and whether an eating disorder is present. Not only can the diet affect oral health, but also oral health can affect eating patterns. This is particularly true in individuals with very poor oral health, who may not be able to chew without pain or discomfort. Older, edentulous (having no teeth) patients who have had a stroke with the accompanying chewing and swallowing problems may be at significant nutritional risk, particularly if they are living alone and on a limited income. Finally, malnutrition (both undernutrition and overnutrition) have specific effects on oral health. Although oral diseases associated with vitamin deficiencies are rare in the United States and other industrialized countries, they may be common in emerging "third-world" nations. In these countries, the limited supply of nutrient-dense foods or the lack of specific nutrients in the diet (vitamin C, niacin , etc.) may produce characteristic oral manifestations. In addition, unusual food practices, such as chewing sugar cane throughout the day or other regional or cultural nutritional practices, may decrease the oral health of specific populations. Vitamin-deficiency diseases may produce characteristic signs and symptoms in the oral cavity (mouth). For example, in a typical B-vitamin deficiency, a person may complain that the tongue is red and swollen and "burns" ( glossitis ), that changes in taste have occurred, and that cracks have appeared on the lips and at the corners of the mouth (angular cheilosis). In a vitamin C deficiency, petechiae (small, hemorrhaging red spots) may appear in the oral cavity, as well as on other parts of the body, especially after pressure has been exerted on the tissue. In addition, the gums may bleed upon probing with a dental instrument. In humans, calcium deficiency rarely, if ever, causes the production of hypoplastic enamel (poorly mineralized enamel) similar to the osteoporosis produced in bone. 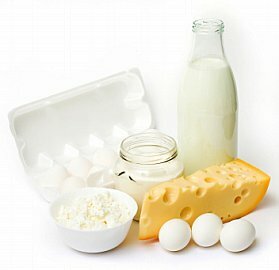 Teeth appear to have a biological priority over bone when calcium is limited in the diet. Oral health problems associated with nutritional deficiencies occur not only in populations with a limited food supply. Individuals whose chewing and swallowing abilities have been compromised by oral cancer , radiation treatment, or AIDS may also exhibit signs and symptoms of nutritional deficiencies. The proliferation of foods high in calories , fat , sugar, and salt, and low in nutritional content—such as that found in fast-food restaurants and vending machines—has created a "toxic" food environment in many industrialized countries, and this has had an important impact on oral health. Oral bacteria have the ability to synthesize the acids that dissolve tooth enamel from many different types of foods, not just sugar. Frequency of eating is a major factor related to poor oral health in infants, as well as children and adults. Baby bottle tooth decay, also called nursing bottle caries, is a term that refers to the caries formed when an infant is routinely put to sleep with a bottle. Breastfeeding caries is a condition associated with the constant exposure of an infant's oral environment to breast milk, while pacifier caries occurs when a pacifier is dipped in honey prior to inserting the pacifier into an infant's mouth. 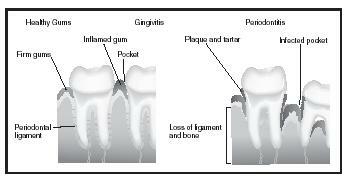 Oral diseases like gingivitis (left) and periodontitis (right) may result from overnutrition. When food consumption is excessive, or when the foods consumed are frequently sugary or acidic, the enamel on teeth can dissolve and gums can be infected. day is correlated not only with obesity in children, but also with increased caries. The American Academy of Pediatrics has warned parents on the overuse of fruit juices in children's diets. Although diet soft drinks do not contain sugar, they do contain both carbonic and phosphoric acids and can directly destroy tooth enamel, particularly if the teeth are periodically exposed to a diet drink throughout the day. The direct demineralization of tooth enamel by regular and diet soft drinks has similarities to the demineralization of tooth enamel common in anorexia nervosa, in which forced regurgitation of food exposes lingual tooth surfaces (the side of the tooth facing the tongue) to stomach acids. In the case of enamel erosion produced by soft drinks and juices, effects are usually seen on all the tooth surfaces.